If you ever wondered why Jack's magical beans grew so tall in "Jack and the Beanstalk," you probably have never seen pole beans. These vigorous climbers twine around poles or other supports and grow to heights of 6 feet or more. Slender green beans are nearly twice the size of bush beans and bursting with flavor. Picked when they are young, pole beans make a nutritious snack straight from the vine or can be cooked and served as side dish. Harvest pole beans when pods are plump but before the skin begins to toughen. Tiny beans should be barely visible through the pod. 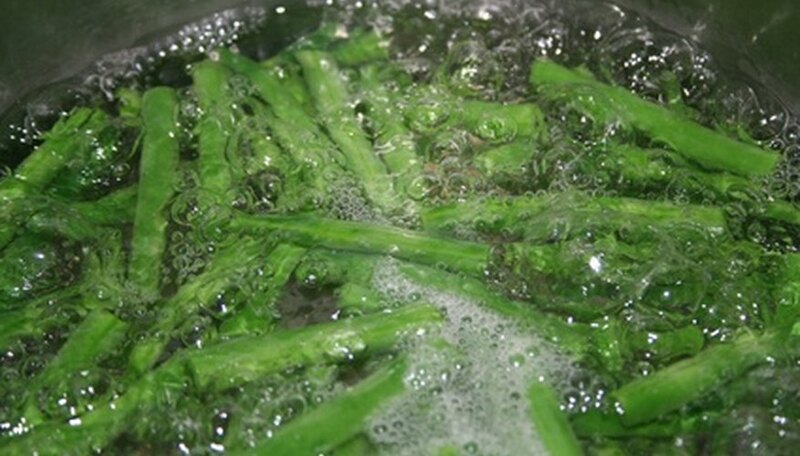 Wash beans in cold running water to remove any dirt or insects. Trim both ends with a knife or snap by hand. Fresh beans snap easily. Cut or snap into the desired size. Small, tender beans are typically cooked whole, while larger, more mature beans are cut into 2-inch sections. Pour an inch or two of water into a saucepan, and bring to a rapid boil. Drop beans into the water, and return to a full boil. Reduce heat to simmer. Simmer for 4 to 5 minutes until beans are fork-tender. Check beans at 2 minutes, as cooking time varies depending on the texture of the bean. Cook with the least amount of water possible to preserve flavor. Use pole beans in any recipe calling for green beans, but increase cooking time, as pole beans require slightly longer to cook than bush beans. Pole beans can be steamed or cooked in the microwave.